April is National Poetry Month! 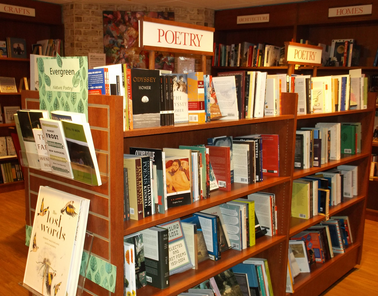 Come in and shop the Poetry Section, which is comprised of North Carolina Poets, General Poetry, and Poetry Anthologies. We have a special display right now of nature poetry. We're thrilled for local poet Tyree Daye who recently added a Whiting Award in Poetry to the list of his awards. He is the author of two collections: River Hymns, the 2017 APR/Honickman First Book Prize winner, and Cardinal, forthcoming from Copper Canyon Press in 2020. In January, we lost one of the nation's greatest poets, Mary Oliver, who was a winner of the National Book Award, and the Pulitzer Prize. We have a wide selection of her volumes, including the recent Devotions, her personal selection of her best work, spanning an esteemed literary career. Birds LLC Press - During 2019 we're celebrating an independent press each month, and naturally for April, we've chosen a poetry press. 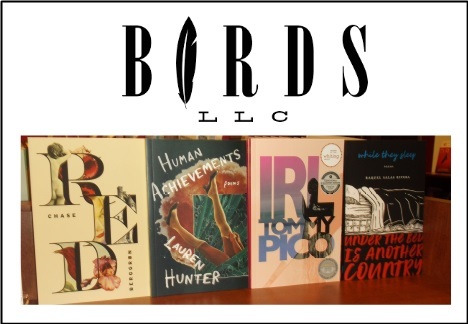 Birds, LLC is a small press based out of Austin, Minneapolis, New York, and Raleigh, that supports readings, events, and podcasts for their authors. They believe that poetry demands a human voice to read it and an audience to hear it. You'll find some of their titles in-store on our Indie Press of the Month display, and on the book list below. On Sunday April 13th at 2:00 p.m., we're welcoming several contributors to the new, poetry-rich, online issue of the 2019 North Carolina Literary Review, featuring African American writers of the past and present. More on that event here. On Sunday June 2nd at 2:00 p.m. we'll welcome Beth Copeland, Tina Barr, and Iris Tillman Hill reading from their volumes. Check out some of our favorite poetry books below. The 2019 Pulitzer Prize winner. Drawing from his experience as a translator, Gander includes in the first, powerfully elegiac section a version of a poem by the Spanish mystical poet St. John of the Cross. He continues with a long multilingual poem examining the syncretic geological and cultural history of the U.S. border with Mexico. The poems of the third section — a moving transcription of Gander's efforts to address his mother dying of Alzheimer's — rise from the page like hymns, transforming slowly from reverence to revelation. Gander has been called one of our most formally restless poets, and these new poems express a characteristically tensile energy and, as one critic noted, "the most eclectic diction since Hart Crane." Poetry. Native American Studies. LGBT Studies. IRL is a sweaty, summertime poem composed like a long text message, rooted in the epic tradition of A.R. Ammons, ancient Kumeyaay Bird Songs, and Beyonce's visual albums. From National Book Award and National Book Critics Circle Award finalist Ada Lim n comes The Carrying--her most powerful collection yet. I truly believe that Andrea Gibson is one of the greatest poets of this generation. A spoken-word poet, Gibson pulls no punches, going straight for the kill with imagery that hits you in the gut and purpose that moves your soul. She's a champion for the LGBTQ+ community, unafraid to tackle tough subjects. If you ever have the chance to hear Gibson perform, do not hesitate to attend. In the meantime, read this book. “I started wishing on the stars in the sky. From Amber: This is a collection of lyrics, as well as sketches, poems, and various ephemera, from the face, voice, and pen of the band Florence + the Machine. This beautiful edition would make a great gift for any fan, and even for those who have never heard the music before but have a love of poetry and an artist’s process. In 2007, when a new edition of the Oxford Junior Dictionary -- widely used in schools around the world -- was published, a sharp-eyed reader soon noticed that around forty common words concerning nature had been dropped. Apparently they were no longer being used enough by children to merit their place in the dictionary.